With SharkCAD Pro-AP (formerly Shark FX-AP) at your fingertips, professional 3D models can be created accurately and easily, at a fraction of the cost of comparable premiere CAD programs. 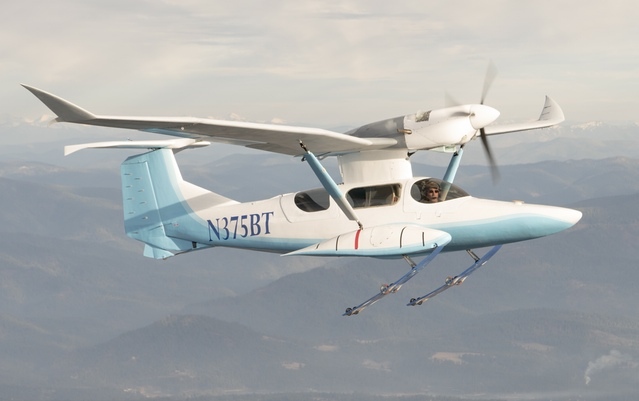 The robust 3D modeling capabilities include Mesh Modeling, Solid Modeling and Surface Modeling, which allow you to easily render airplane prototypes and anything else that requires high-end visuals. SharkCAD Pro-AP is perfect for engineers, drafters, artists, scientists and hobbyists looking to turn a concept into reality.  SharkCAD Pro-AP combines AeroPack with SharkCAD Pro v10. AeroPack is a collection of unique drawing tools created specifically for airplane design. 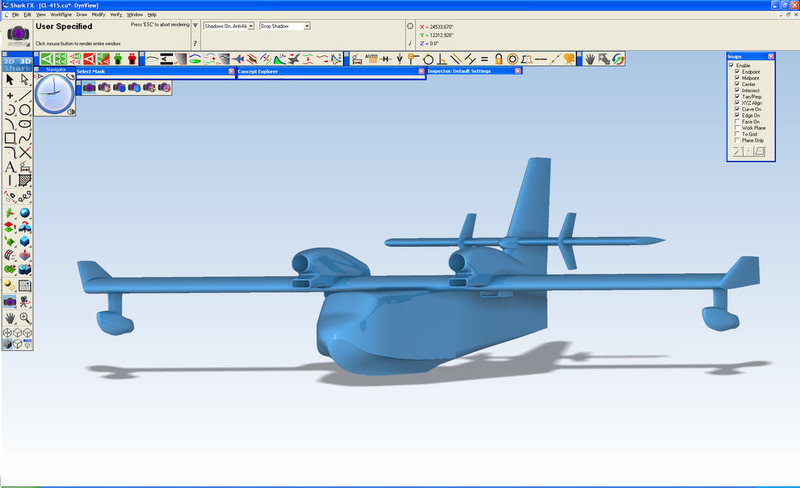 Tools such as Create Airfoil, Wing Planform and Polyconic Surfaces allow airplane components to be 3D modeled with a matter of clicks. 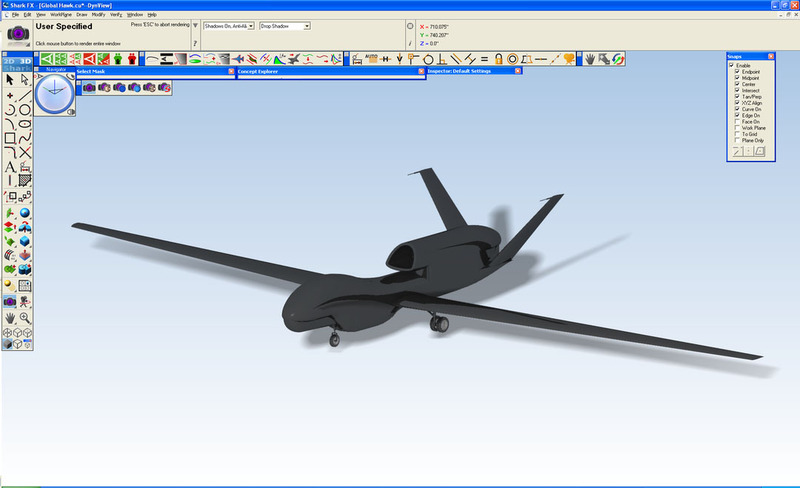 The Import Airplane tool allows users to import geometry from Advanced Aircraft Analysis (AAA) into SharkCAD Pro-AP as a 3D model. 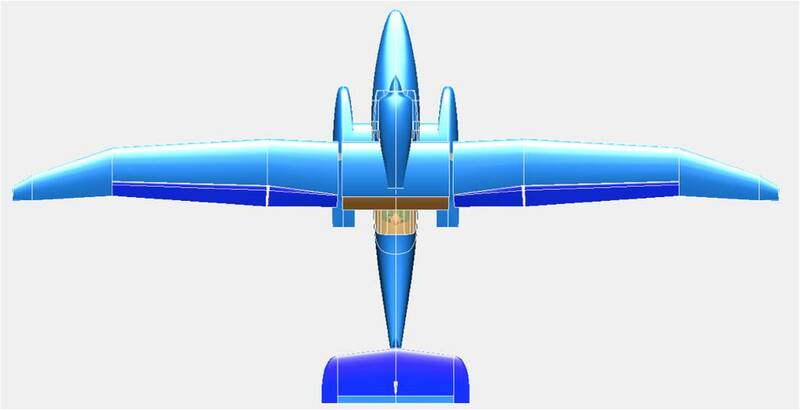 Bundling SharkCAD Pro-AP with AAA will save you hours on geometry input and allow you to quickly and easily visualize your airplane model in 3 dimensions. 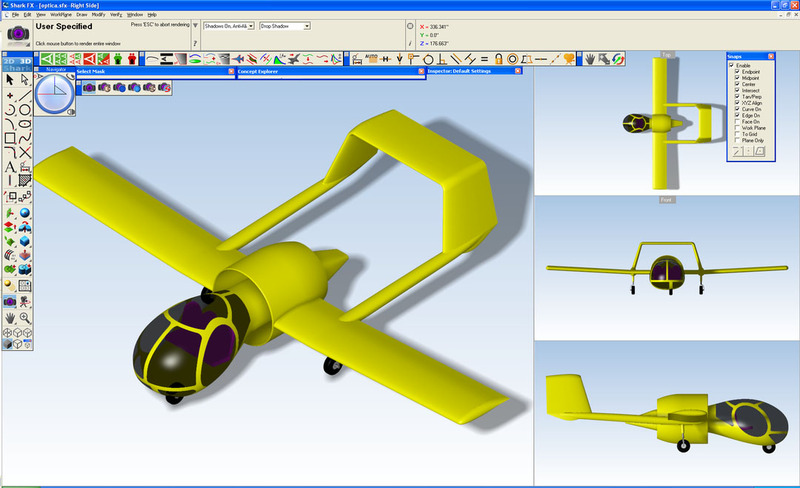 Once your geometry is defined you can export your completed airplane from AAA into AeroPack as a 3D model to review or create a high quality graphic. Quad mesh tools have been introduced to support a new modeling method of subdivision. 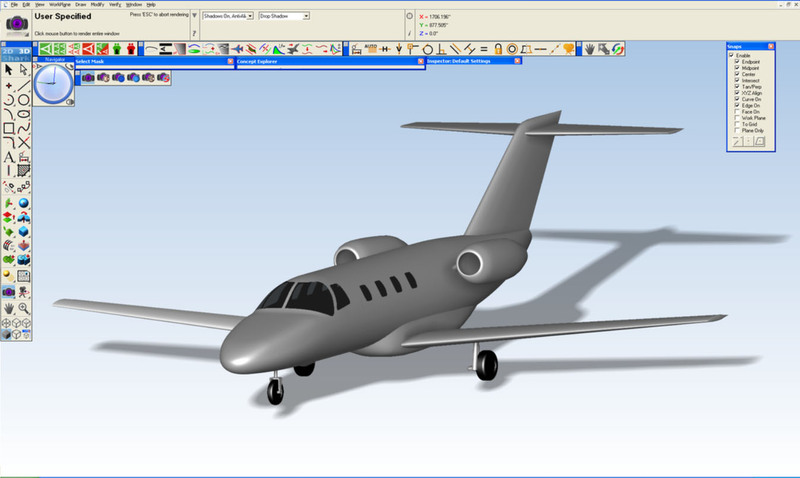 The tools are now accessible through the mesh tool palette in the main tool window. 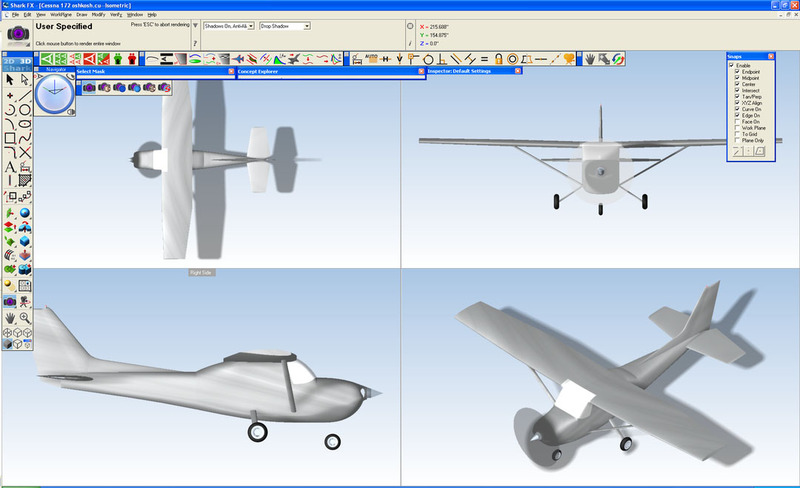 The quad mesh suite of tools enables an alternative conceptual design process based on mesh modeling. One of the advantages of mesh-based modeling is that models can be quickly pushed or pulled into complex shapes, whereas precision solids have some limits in what you can push or pull. 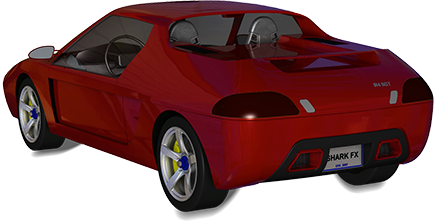 The mesh tools focus on creating quad meshes, which are suitable for subdivision modeling techniques. 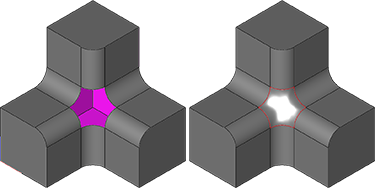 Create three or four sided meshes. Or load mesh points from STL, OBJ, or PLY files. Create mesh primitive shapes using block, sphere and torus shapes. Use curves to create mesh surfaces from skin, lathe, extrude and cover tools. 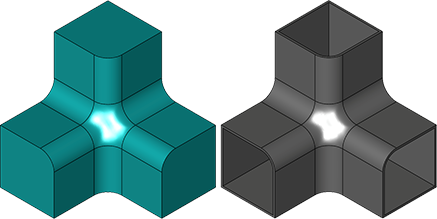 Connect two regions together by combining and merging facets, edges and vertices. Inserts a new row of facets, edges and vertices into a part, providing additional control over regions of a meshed part. Add a cap or fill a hole of a meshed part. 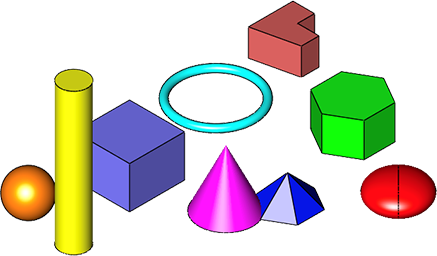 The Subdivision Tool will smooth a collection of triangle or quads. The smoothed representation is used for display while preserving the control polygon for editing. 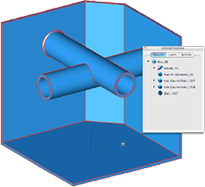 Bridge the gap between mesh and solid modeling with Shark’s state-of-the-art mesh to NURB tool. 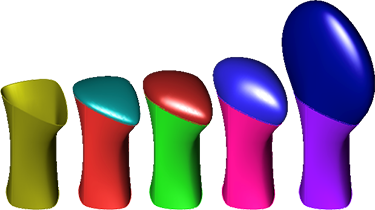 Convert quad dominant meshes to primarily G2 continuous NURB surfaces and solids. 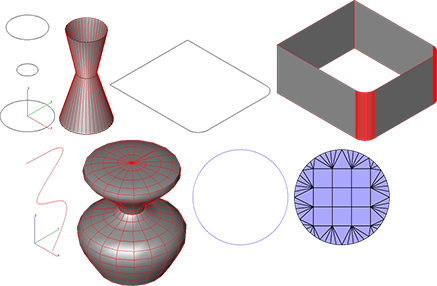 Meshes converted into solid models are suitable for feature-based operations such as blending, chamfering, and shelling as well as sharing to precision file formats such as STEP. Create parts from meshes that are associative. Change the mesh and the associated solid and operations automatically update. Primitives are simple shapes defined by linear or quadric geometry. Shark supports spheres, blocks, cylinder, cones, torus, prisms, pyramids, ellipsoid, and slabs. Choose any of the nine different solid primitive types to create quick simple shapes. Modify at any time using parameters such as width, height and length. 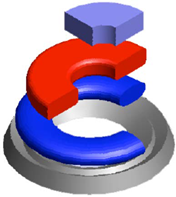 The Lathe Solid command rotates any closed 2D polyline, circle, ellipse, closed spline or polygon. You can also lathe groups of closed curves. The Extrude Solid command takes a profile and extends the shape a user specified distance. You can extrude 2D polylines, circles, ellipses, closed splines, and polygons. There are five extrude methods. Smooth edges or faces using state-of-the-art blending technology. Apply constant, variable, fixed, or hold lines. The Shell tool allows you to select faces to leave open. If no faces are selected, the part is hollowed inside. Hollow a part and keep select faces open. 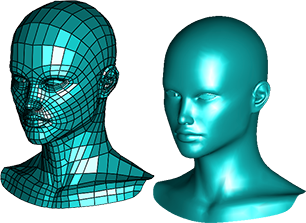 Modify individual faces for specific thickness values. The Split Solid command divides a solid into two components. The Split Solid command is useful for displaying solid sections in drawings and for creating large stereo lithography models. Provide further clarity to your part designs by splitting or trimming away portions that hide key design features. Split your part with complex shapes such as cutting planes, NURBS, or other parts. Directly edit faces of solids independent of previous construction history. Remove, translate, replace, match, or offset faces of part. 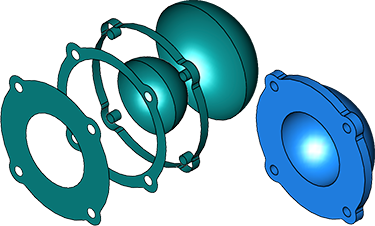 Great for working with parts designed from other CAD systems such as AutoCAD®, Pro/E™, or SolidWorks®. Examine the construction history of a part with Concept Explorer. Suppress, remove, or access parameters through the construction of the part. Calculate precise volumes, weights, interferences, centers of gravity, moments of inertia, and other critical data associated with parts. Shark supports nine surface types that are created by referencing curves. Infinite Plane: The Infinite Plane Surface is the simplest surface supported by Shark. An infinite plane is defined by a location and normal. 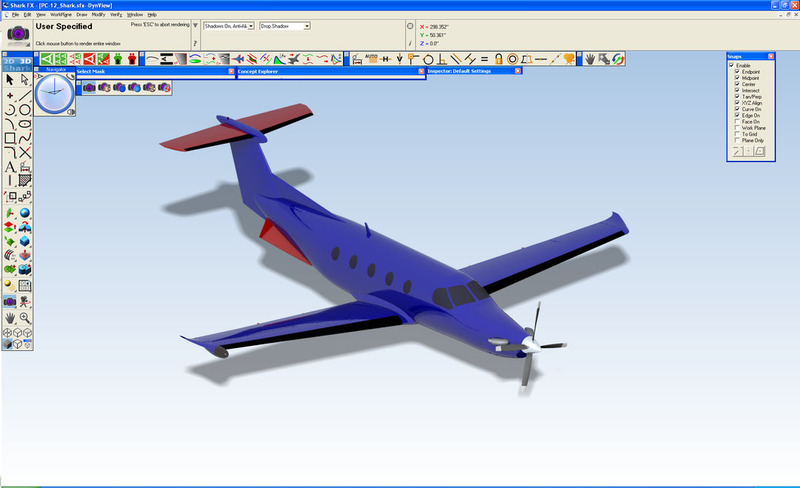 The plane surface is useful for generating cross- sections through meshes, surfaces or solids. Net: The Net Surface is created from a collection of m x n curves. The curves may be combinations of lines, splines, arcs, ellipses, conics or circles. Each curve must be a single curvature continuous curve. 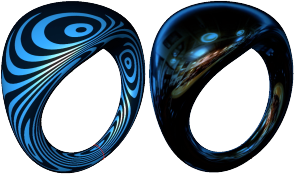 No groups (composited curves) are allowed. A point is allowed at either the start or end of the surface. The supplied curves do not need to be planar and do not need to touch. 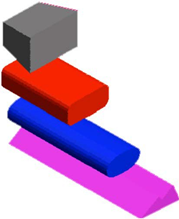 Ruled and Skin: A Ruled Surface has straight spans between each section. Sections can be of any curve type. This tool is available from the sub-tool palette. A Skin Surface fits a network of NURBS patches to a collection of curve cross sections. The curves can either be all opened or all closed. Cover: The Cover Surface is an extremely versatile and powerful utility for creating a surface from curves connected end to end. Curves suitable for cover surfaces include arcs, circles, lines, splines, ellipses, and conics. 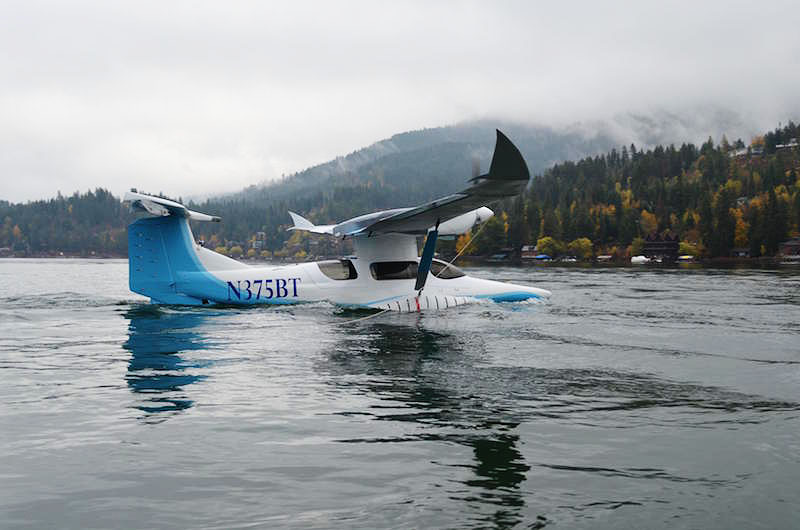 Curves are not required to be in a plane. Extrude: The Sweep Two Points surface sweeps a curve, collection of curves or group along two user supplied points that define the direction and length of the sweep. Swept: The One Rail Sweep Surface sweeps a curve, collection of curves or group along a user supplied rail curve. The resulting surface is associative to both the path and sweep curve. Modifying either will automatically update the associative sweep surface. Bi-rail: The Two Rail Sweep Surface tool creates a swept surface by sweeping an open or closed curve between two rail curves. The rail curves define the orientation and scale of the surface as it moves between the two curves. Tube: Creates a tube or pipe surface along a curve with a given radius. Shark’s unique fill and cap surfaces provide a means to create tangent continuous surfaces suitable for repairing and stitching surfaces into solids. Precisely offset complex surfaces into a solid by using the thicken tool. The thicken tool also allows the user the choice to thicken a specific face or the entire solid. The Stitch tool provides a way to stitch, or sew, separate surfaces together to make a solid body that is topologically complete. Stitch collections of individual surfaces into water-tight volumes. Utilize options that repair and heal less than perfect connections. The Match Surface tool modifies the surface continuity at a given edge to a referenced edge. Match surface continuity between shared surface edges. Visualize surface quality using zebra, curvature, and environmental maps. Software purchase includes CD-ROM, WibuKey and 12 months software maintenance (tech support, service releases and new version upgrades). Educational & multiple license discounts. SharkCAD-AP/SharkCAD Pro-AP is protected by online registration and authorization code provided by Encore Software, LLC.